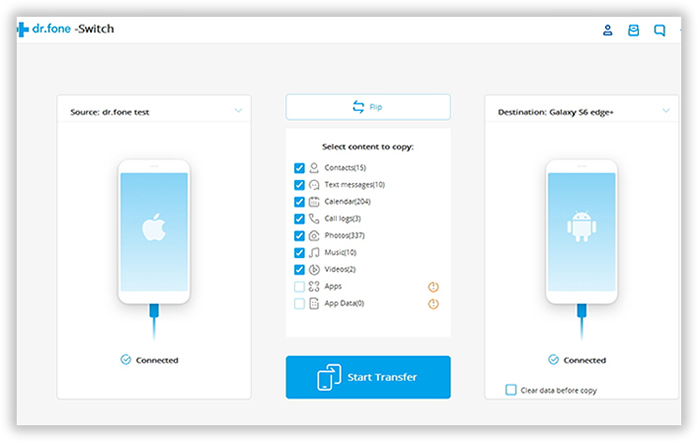 Only 3 simple steps ahead to completely transfer multiple types of content from one smartphone to another. 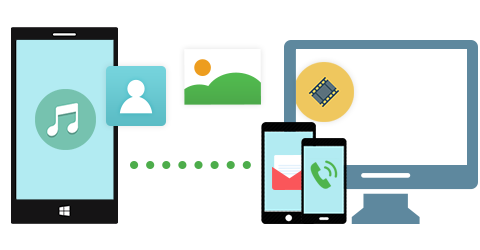 User-friendly program with flexible options to backup, restore and erase all kinds of smartphones. 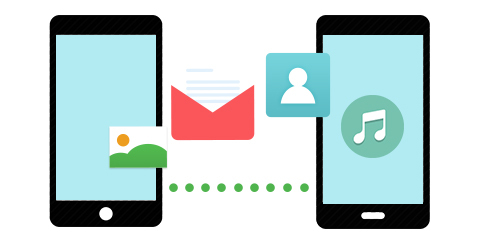 TunesBro Phone Transfer is by far the fastest program to transfer data between two smartphones. There are only 3 steps to fully copy selected items from the old device to the new one. This powerful program also has an intuitive user interface, making it super easy to understand how it actually works. Estimated Time Frame : 5-15 minutes. Each mobile operating system has unique rules to storage user data. So it is impossible to transfer all content and settings from one smartphone to another. So we gather a list of data flaw for the transfer process. Please check it carefully and make sure the desired data type is supported when switching to a new phone. 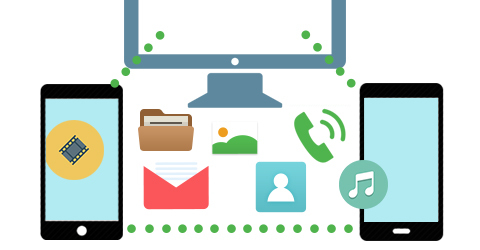 Unlike other transferring software or apps, TunesBro Phone Transfer is the easiest solution you can find out online for data transfer between smartphones. You can complete the whole process with only 3 mouse clicks. Backing up phone data to computer is a much more secure and convenient way to protect data from potential damage. It would take hours to backup your phone to cloud services. This is why we insists adding backup feature to TunesBro Phone Transfer. 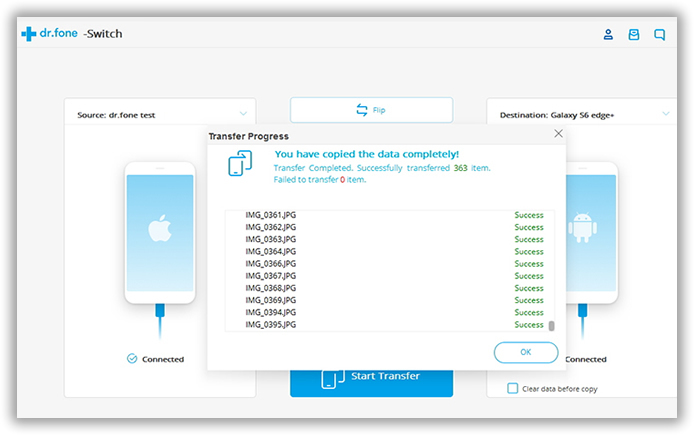 With it, you can easily transfer phone content to Windows PC or Mac in only a few minutes. It is evitable to wrongly delete files on smartphone because of the touch-based nature. And it would be much harder to directly retrieve deleted files from the phone. However, once you backed up the phone with this program, you can preview and restore deleted or lost files from a single click. This makes sure important data is well protected. It is a common practice to sell or give away the old phone when getting a new one. However, no one is willing to exposure his or her private information to others even for those ones you are familiar with, right? This is no more a problem with the help of TunesBro Phone Transfer. It has a built-in module to permanently erase all content and settings on a target device. After that, no one would steal a single piece of information from that device. Your privacy is well guarded. Directly download backup file from iCloud and extract them to new phone without data loss. The best choice if you backed up the old iPhone with iTunes. It can extract content from iTunes backup file. Pull off data from Samsung Kies backup. This is a great option for Samsung	Galaxy	phone users. Use a Windows mobile smartphone and backup it with OneDrive service? No problem with the help of this app. Since the early days of its release, TunesBro Phone Transfer has won a lot of positive reviews from various new editors across the world. It is the first program available online in 2013 to seamlessly transfer data from one phone to another. "I used to manually add my contacts on my new phone in the past. This is really disgusting. But with TunesBro Phone Transfer, it only took 5 minutes to transfer my contacts list (over 500+) to my new iPhone 7. I want to say thank you to TunesBro as it saves me a lot of time during the transition."